I am very pleased to have an interview with Story SlamMN! winner Loren Niemi for this week’s post. Loren and I have performed together on a couple of occasions, most notably in Saving Pagan Babies for the Spirit in the House Festival (where my story Two Falling Voices was originally performed), most recently in The Computer Wore Semiotics at the 2012 Minnesota Fringe Festival. He also directed my first solo Fringe festival performance in 2011. I can’t remember where he placed among the winners of the “Thankful” slam – but I am thankful he agreed to answer my questions. For those who were not at StorySlamMN!, please give a quick summary of what your story was about. What connected it to the theme “thankful”? Truthfully I don’t remember which story I told. They are chosen in the moment from a set of possibilities and crafted accordingly. How did the idea for your story come to you? Did you create this story specifically for the slam, or did you use a story you have told in another context because it fit the theme? For me slam telling is a practice exercise to keep my telling limber. Whether I tell an older longer story that I’ve told many times (50%) and must be compressed into five minutes, tell a story I seldom tell but it fits the theme (40%) or am telling something “brand new’ (10%) which I am in fact telling for the first time – the objective is to tell to make the 5 minutes count. The theme helps with the selection process but the telling is what matters. Is there a particular practice or process you find helpful in shaping your story to fit within the theme and time limitations of a slam? The question I always want to get to is the ratio of narrative (stuff happening) to description (physical detail or emotional nuance) that is possible in any story for any theme. Can I bring the judges to a single moment? The question behind that performance question is when in the slam progression am I telling? Early before the judges reveal their preferences? Late when I know what others have told and I can compare, contrast or extend an element? Answering that question determines the balance between humor or not…. and often determines which story is told based on what any particular story is about and what ways it will lend itself to telling. What do you think is the most difficult thing about telling a story on stage? What is the most rewarding? What is most difficult is getting the dynamic between what I am telling and what others are. The essence of the slam experience is not many tellers of different abilities trying to offer a particular take on a theme in a short time and being judged by some criteria, but an audience witnessing that experience. The difficult thing is to make my story add something unexpected and satisfying to the audience experience (regardless of score). The most rewarding is to have an audience member tell me afterwards that the story moved them, that they liked it or it reminded them of X…. Loren Niemi has been creating, collecting, and performing for audiences of all ages since 1978. Loren teaches storytelling in the Theater program at Metropolitan State University and is the author of The New Book of Plots and the co-author with Elizabeth Ellis of Inviting the Wolf In: Thinking About Difficult Stories. He is the Producer of Two Chairs Telling, and Executive Director of the acclaimed In the Heart of the Beast Puppet and Mask Theatre, which is holding its 40th annual May Day Parade on Sunday, May 4, 2014. Loren’s storytelling web site is here, and he blogs here about Stories, Politics, and Oddities. 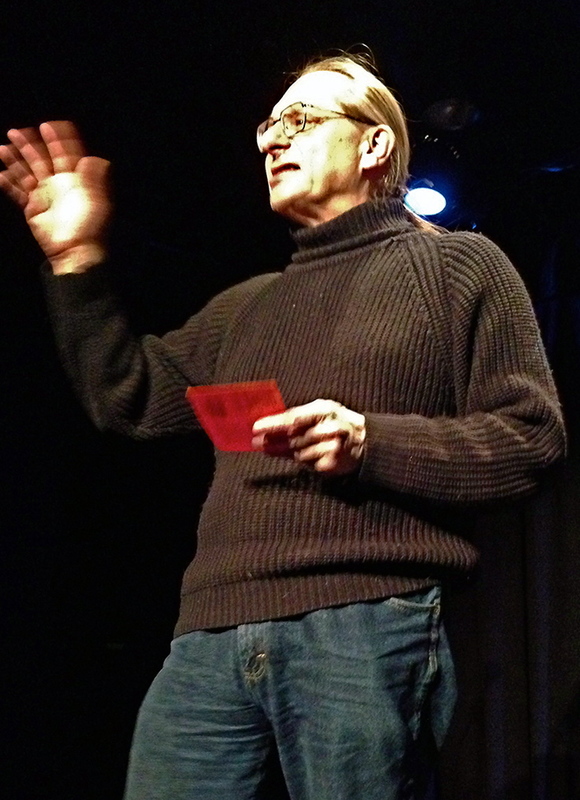 You can see Loren tell one of his signature stories, performed for Kay DeMartini’s Real Stories CA, below. It’s not a slam story. Get yourself a drink, stretch out and listen for awhile. That’s an insightful interview! Great links, too for someone exploring the performance of storytelling. Thanks, Charli! It’s a privilege to be able to offer a forum for performers I enjoy to talk about their craft – and on occasion, to share a bit of their work. Great interview, Paula. I’ve never been to a story slam (we only have poetry slams) but I really enjoyed gaining insights into something I’d never have the nerve to do, but which as a writer and audience member I know I’d love. And thanks for introducing me to Loren Niemi! You’d be surprised at what kind of nerve you might have, Teagan. The last person who won one of these admits she suffers from terrible stage fright. (Her interview is yet to come.) I’m glad you enjoyed meeting Loren.